This was the question raised by people who saw the 0.5-carat diamond with edge surrounded by small diamonds located in front of 3rd floor Gembros exhibition hall of Seoul COEX Samseong-dong on April 19th, 2012. From a distance, the 0.5-carat diamond is bigger by 1.5 times, which is attributed to “invisible mosaic” that fills in many small gemstones to make it look like a big precious stone. Although the gemstone itself is beautiful and precious, but the value of gem with a cause is greater than its beauty. Because of been used by Bae Yong Joon to give to Choi Ji Woo as a gift in 2002 drama series “Winter Sonata, the “Polaris” necklace was extremely popular in Japan, and continues to sell until now. The necklace that Mucha, which created the Polaris, sponsored in TV series “Love Rain” starring Jang Geun Suk is very popular. Recently on April 18th, 2012, export contract was signed with Japanese company which worth $20 billion South Korean won (about $17.56 US dollar). At the “2012 Korean Jewelry Expo” held from April 19 to April 22 in 2012 at COEX, the gemstones with unique design and technology, and have various causes are pooled together, and 240 domestic jewelry enterprises attended. According to the Korea International Trade Association, last year, the export of jewelery products was valued at about $200 million US dollars (about $228 billion South Korean won). The exports to Japan, Thailand and other Southeast Asian countries where Korean wave (Hallyu) are prevalent increased by more than 60%. 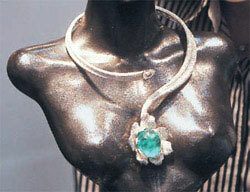 In addition to domestic enterprises, more than 60 jewelry brands from 17 countries participated in this exhibition. Korea GIA (Gemological Institute of America) specially invited the jewelry business, “Karen”, to show the the highest grade 64-carat emerald gemstone necklace, rose-cutting diamond necklaces are other valuable products that are made in Columbia and cannot be bought domestically due to individual consumption tax. In the exhibition, also can see the color diamond jewelry that is popular abroad.